Even though I still don't 100% agree with the Vick signing my interests are still peaked (to say the least) so I turned on the Reid, Vick, and Dungy press conference this afternoon. 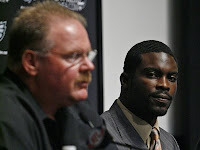 In short, I am beginning to sway a bit on the Vick signing. Again, this fan will never forgive or forget the animal crimes committed by Vick. But Vick has been given a 2nd chance by our Eagles and I am an Eagles fan, so I will support Vick on the field. I have other role models in my life so I don't need to look up to an athlete to learn how to carry out my life. One signing doesn't make me not like the Eagles. The team and the sport let me escape from life's stressers. I will still be at the Linc cheering on the Eagles come NFL Sundays. If Vick helps in getting the Lombardi to Philly, well then he only adds to the enjoyment of my Eagles football.